I don't really know how to sound intelligent or deep. I'm a super opinionated person, with nothing really to say. I read all sorts of blogs and Internet sites trying to gain knowledge on things that will make me sound like I know what I'm talking about, but I don't really know anything about the important things of life. Well, there is one exception to that. I actually know the most important thing in life. But I don't live like I do, or share that knowledge. If fact, most of the time I live and act and speak like I don't know this crucial truth to our existence. I know there is a deep and critical purpose for our lives. I know this purpose brings hope and joy. I know that, without understanding this purpose, besides the eternal damnation we face apart from this truth, our lives will be lived hopeless and frustrated, filled with hated, anger, and emptiness. The crazy thing is, even with this knowledge in my own head, I live in a negative place right now. And this is because we are not called to merely understand this purpose, but we are told to live it. I turned 35 last week and I've started to take a look at my life, maybe for the first time. I've been looking at where I came from, where I am, what I've accomplished, and what I've set as goals. I started my life in a loving family, where I was raised, protected, and guided in the knowledge of God. I grew into an involved member of the Church, playing music in worship services, leading small group discussions, working on my own relationship with God, studying the Bible, and trying to live my life to please God. Currently, my life is a joke. There is nothing in it that resembles a life lived in faith. Sure, I go to church on Sundays where one of the most dynamic preacher I've ever heard teaches, I teach my kids about God, I pray with them, I even pray (mostly plead) on my own, but there is no living by faith. My wife and I have had our share of tragic happenings, from medical things and deaths in the family to financial and job related trials, but our prayers and requests for God's help and guidance are far and few between. We don't live in faith. We don't live as though we understand our purpose for existence. I am a huge failure. I place a lot of the responsibility for my wife's spiritual maturity on my own shoulders. I should be leading this family into meaningful, deep, real, solid relationships with God. Instead, I'm the one that is to angry and frustrated at the outcome of my life this far to be a positive force in this family. As someone who was raised in the church, with lots of access to the Bible and teachers and examples of God pleasing people, i should lovingly lead my wife and kids into God's light and grace. I have the chance to show them God's grace and love, and that our purpose is to enjoy glorify Him. But I'm selfish, frustrated, sinful, and horrible. I don't bring God glory with my own life, so how can I teach my family to do the same? After 8+ years together, how is it my wife is still a baby Christian and I've now become someone who doesn't even resemble one at all? Knowledge is nothing without actions. Just like James 2:19 says "even the demons believe - and shudder". It's not knowledge of God that saves. It takes faith in our need for Jesus. We must give up self control. We MUST realize we can never be good enough on our own. Apart from God, we are nothing. Our purpose is to glorify God, who is the Creator of all things. He gave us free will, and then a Savior to save us from ourselves. Think of it like this: we are called to go out into the world and reveal God to those we meet. But it we don't know God ourselves, who can we share Him with others? I need to wake up and live this knowledge. I am nothing apart from God. I deserve eternal damnation because of my sins. And without God's Son, Jesus, I'd be there. But by the grace of God, I am saved from these sins by the perfect lamb, sacrificed for me. Now I have only one reason to exist: I MUST GLORIFY GOD! Break-dancing has always been cool to me. The kids who have it so rough, fight back with dance like no one's business. Okay, it's just cool to watch. This is pretty cool. 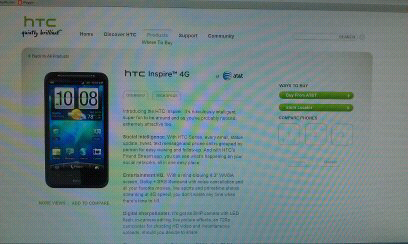 My full review of the HTC Inspire should be up soon. Just something to impress, entertain, and make you laugh. This is crazy. I love the person responsible for using a pail to empty out the boat that apparently has a pretty significant leak. 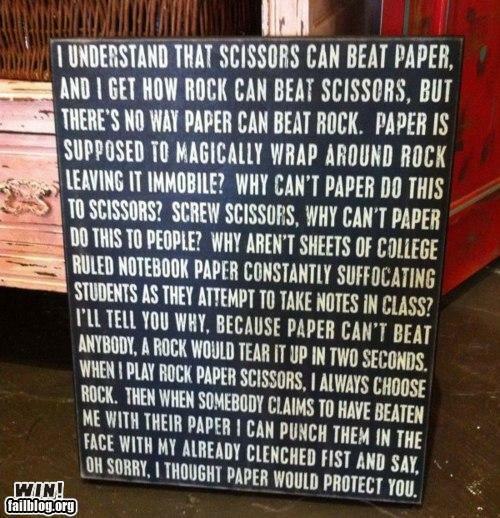 If you ever want to play Roshambo (Rock, Paper, Scissors) with me, be prepared to get punched. I just found what I'm going to do this summer on one of my trips to Redding. This is so cool. OH. MY. GOODNESS. This guy can play the piano, or at least the theme to Star Wars. I actually didn't know this was possible for one person to play this well and full. There is so much going on in this song, that I didn't think one person could pull it off, at least on a piano, all at the same time. I guess I was wrong. I watched the iPad event video and I actually thought, "who is the idiot they pay to yell 'whoa' everytime Steve says something at one of these events that is supposed to get a big reaction?" Apparently, I'm not the only one who thinks Apple over-hypes their products. Now, I'm not saying I don't think this product is great, because it is pretty cool (although it still is missing flash, which is still a bigger part of the Internet than most people will admit; try watching the embedded video in this post for example). It's just that Apple has their set way about things and if stops them from being even greater. I think Conan's video says it well. Head's up for the bleeped out cuss word at the end. I'm still not sure what Ford is thinking with front wheel and all wheel drive Taurus and Explorer based Interceptors, but maybe this video series will show us why they think these are better cars for the job of police vehicle than they tried and true Crown Victoria based Interceptor. I'll tell you what, I believe cops want a rear wheel drive car. I believe they want a little more room and a little more power, but most of them are happy with the current format. The Dodge Charger is going to be the go to police vehicle if Ford doesn't bring something like the Vic to the table. On March 7th, we will see what 4 real cops an undetermined number of cops (because it says "from the United States and Canada" and Canadian cops aren't real) were paid to say about these 2 new Interceptors from Ford. Not great, but funny enough.